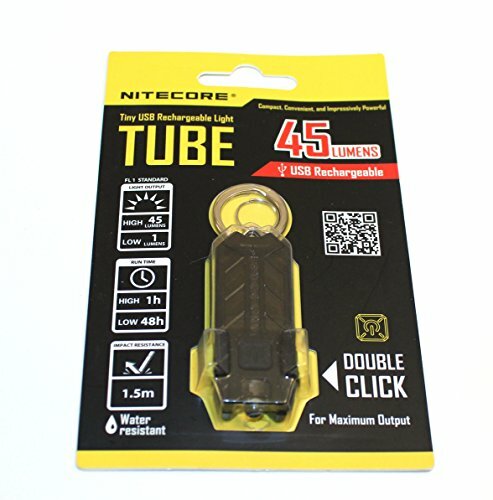 The Nitecore Tube is the world’s lightest rechargeable flashlight weighing in at only 9.6 grams. Featuring a built in high efficiency Li-ion battery that provides runtimes of up to 48 hours from a single charge via micro USB. No key ring should be without one! The high performance LED has a maximum output of 45 lumens with infinite variable brightness control. A beam angle of 100 degrees provides a flawless wide beam to illuminate peripheral vision. Maximum beam distance is 24 meters. Easy one handed control is at your finger-tips with a simple and intuitive user interface. 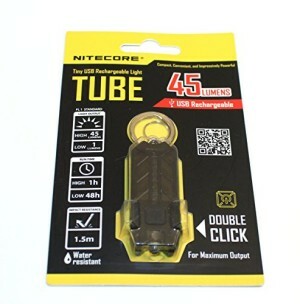 • High performance LED produces 45 lumen on high setting (runtime 1hr) • Built-in rechargeable Li-ion battery provides a runtime of up to 48 hours on low setting. • Charges via Micro USB (cable not included) • Single multi-stage switch offers access to all functions via one-handed control • Features two brightness levels and infinitely variable output mode • Features extremely wide 100° flawless beam to light up peripheral vision • Constructed from durable Polycarbonate materials • Dual metal key ring connector withstands up to 35 kg • Impact resistant to 1.5 meters, Water resistant. • Extremely lightweight, compact and portableTiny USB rechargeable light.